13 Above: I Was Hitler's Secretary .... Guess Who ? Working as Hitler’s secretary from 1933 until his suicide in 1945, the young Christa Schroeder never knew a private life. In 1938, she became engaged to Yugoslav diplomat Lav Alkonic. When Hitler refused to give his blessing to the liaison, Schroeder raised the possibility of leaving his employment. Hitler replied: ‘I would know how to prevent that.’ The engagement was broken off in 1941. After the collapse of the Third Reich Schroeder was arrested by the US Army Counter-Intelligence Corps (CIC). Initially convicted as a war criminal, she was later reclassified as a collaborator and released days later, on 12 May 1948. Dr Karl Brandt, formerly Hitler’s emergency surgeon, described Schroeder under interrogation at Nuremberg: ‘Clever, critical and intelligent, she had a turnover of work which no other secretary matched, often spending several days and nights almost without a break taking dictation. She would always express her opinion openly...and in time became sharply critical of Hitler himself. Her boldness undoubtedly put her life in grave danger.’ In civilian life, she worked in the metal and insurance industries, retiring at 59, and living in Munich until her death, aged 76, on 28 June 1984. When replying to a tiny job advertisement in the German newspaper, Münchner Neuesten Nachrichten, I had no premonition that it was to determine the future course of my life. It was 1930, and aged 22, I had just arrived in Munich from Bavaria, eager to explore a new part of Germany. The post was a secretarial one and I was invited by an unknown organisation, the 'Supreme SA leadership (OSAF)' to present myself in the Schellingstrasse. In this almost unpopulated street the Reich leadership of the NSDAP, the Nazi Party, was located at No. 50 on the fourth floor of a building at the rear. In the past, the man who would later become Adolf Hitler's official photographer, Heinrich Hoffmann, had made his scurrilous films in these rooms. The former photographic studio was now occupied by the Supreme SA-Führer, Franz Pfeffer von Salomon and his chief of staff, Dr Otto Wagener. Later I learned that I had been the last of 87 applicants. That the post was awarded to me, someone who was neither a member of the NSDAP nor interested in politics nor aware of whom Adolf Hitler might be, must have resulted purely from my being a 22-year-old with proven shorthand/typing experience who could furnish good references. Once Hitler had become Reich Chancellor, stenotypists were requested to volunteer for the NSDAP Liaison Staff in Berlin. In March 1933 I arrived in the capital. After seizing power, Hitler had installed himself in Berlin's Radziwill Palace. His study, the library, his bedroom and later, alongside it, Eva Braun's apartment were all on the first floor. Directly opposite the door to Hitler's study a couple of steps led to a long corridor, beyond which was the so-called adjutancy wing with the rooms for Hitler's aides. The first room was the Staircase Room (Treppenzimmer), where at least one of us would be permanently on standby, regardless of the hour, should Hitler need to give a dictation. Then came the rooms of Julius Schaub, Hitler's rather unprepossessing factotum, Dr Dietrich (Reich press officer), Sepp Dietrich (commander of SS-Leibstandarte Adolf Hitler, Hitler's personal bodyguard unit) and Hitler's chief adjutant, Wilhelm Brückner. If one descended the staircase beyond these one came to the so-called ladies' saloon, actually the reception room, to the left of which wing doors, always pegged open, led into the film room. To the right was the Bismarck Room, also known as the smoking room. The dining hall was next to it and annexed to the Winter Garden, which ended in a fine semicircular path. Breakfast was taken in the Winter Garden and in the afternoon Hitler held most of his talks strolling its length. One day Hitler happened to pass the Staircase Room at teatime, saw us sitting there and asked if he might join us. This hour of easy chatter was so much to his liking that he later came to tea almost daily. The Staircase Room was a place where he felt unburdened and I always had the impression that what he said there came from a secret memory box which at all other times he kept locked shut. He would often recall pranks played in late childhood, for example, the time as a 12 year-old when he wagered his classmates that he could make the girls laugh during a religious service. He won the bet by intently brushing his non-existent moustache whenever they glanced at him. For Hitler, clothing was purely functional. He hated trying things on. Since he made lively hand and arm movements to emphasise points he was making in his speeches, and also liked to extend his body while strolling in conversation, especially when the subject was one which excited him and which he did mainly by raising the right shoulder, he had an aversion to a close fit. His tailor had to shape all uniforms and suits for comfort in this regard. This occasional raising of the right shoulder may have been due to the left shoulder being stiff. During the putsch of November 9 1923 Hitler fell to the pavement, dislocating his left shoulder. Dr Walter Schultze, the leader of the SA medical corps, could not convince Hitler to have it X-rayed. Hitler feared being 'bumped off' at the hospital. The shoulder was therefore never properly fixed and remained stiff ever afterwards. Hitler set great store on hygiene. He bathed daily, often several times a day, particularly after meetings and speeches, from which he would return sweating. Harsh and inflexible as Hitler could be with others, he did not exempt himself. He would reject tiredness and would call upon endless reserves of energy. No wonder that the trembling left hand was such an embarrassment to him. The knowledge from 1944 onwards that he was no longer master of his own body was a heavy burden. When surprised visitors saw his trembling hand, he would cover it instinctively with the other. Yet to the end he remained master of his emotions. Should bad news arrive during a private conversation the only clue would be a movement of his jaw. I remember him receiving the report about the destruction of the Möhne and Eder dams, which flooded much of the Ruhr. As he read it his face turned to stone, but that was all. Nobody could have gauged how deeply the blow had struck him. It would be hours or days before he would refer to such an event, and then give full vent to his feelings. From his youth onwards Hitler had a great lust to read. He told me one day that during his youth in Vienna he had read through all 500 volumes at the city reference library. I was always amazed at how precisely he could describe any geographical region or speak about art history or hold forth on very complicated technical matters. In the same way he could describe with amazing detail how theatres, churches, monasteries and castles were built. The Oberbürgermeister of Munich, with whom Hitler enjoyed discussing the expansion and beautification of the city, related how surprised he was when Hitler recalled the minute details of a conversation they had had months previously. Hitler had reproached him: 'Six months ago I told you I wanted it done this way!' and then repeated word for word their conversation, a fact confirmed by architects Speer and Giesler post-war. It is confirmed that from his youth onwards Hitler had the gift of an unusual memory, but his secret was that he trained and expanded it every day. He said that when he was reading he tried to grasp the essence of a thing and fix it in his mind. It was his practice or method during the tea hours and when chatting at the hearth over a subject he had been reading about to repeat it several times in order to anchor it more firmly in his memory. Despite the effort Hitler made to surprise people with his rich trove of knowledge, and to show them his superiority, he made sure he never let them know the sources of this knowledge. He was expert at convincing his listeners that everything he said was the result of his own deliberations and critical thinking. Nearly everybody was convinced that Hitler was a profound thinker, and a wonderfully sharp, analytical spirit. Back in the Staircase Room I would wait on standby until a valet shouted through the wing door: 'The chief is asking you to come for dictation!' He would open the door to the library and shut it as he withdrew, hanging a notice on the latch: 'Do not disturb.' As a rule Hitler would be standing at or bent over his desk, working on the punch lines for a speech, for example. Often he would appear not to notice my presence. Before the dictation I would not exist for him, and I doubt whether he saw me as a person when I was at my typist's desk. A while would pass in silence. Then he would close in on the typewriter and begin to dictate calmly and with expansive gestures. Gradually, getting into his stride, he would speak faster. Without pause one sentence would then follow another while he strolled around the room. Occasionally he would halt, lost in thought, before Lenbach's portrait of Bismarck, gathering himself as it were before resuming his wandering. His face would become florid and the anger would shine in his eyes. He would stand rooted to the spot as though confronting the particular enemy he was imagining. It would certainly have been easier to have taken this dictation in shorthand but Hitler did not want this. Apparently he felt himself as if on wings when he heard the rhythmic chatter of the typewriter keys. The typewriter had its own mechanical noise. As Hitler would never be seen wearing spectacles in public, typewriters were later manufactured with 12mm characters so that he could read the script in public without glasses. The 'Silenta' brand machines had the advantage of typing quietly but the keys tended to tangle if one typed over a certain speed. Since Hitler did not – or did not want to – notice this and kept on dictating, this was naturally very unsettling for the typist and often made her very nervous. One became anxious that while unscrambling the keys a sentence might be missed and the text would not flow. The day at FHQ Wolfsschanze had been as dull as any other. After dinner I saw a film in the hope of relieving my boredom, then I went to the officers' mess from where Hitler's manservant winkled me out just as I was getting comfortable. In the hope that the tea session would perhaps not last too long, I promised to return to the mess afterwards. Torn from a convivial environment, I now came to a Führer who wore a frown. I knew that he would be in a bad mood, for the situation at the Russian Front was not good. At that time I was a heavy smoker. Hitler said that because tobacco products were distributed to them freely, even young soldiers who had not been smokers previously had now taken up the habit. They should be given chocolate, not cigarettes. Everybody nodded in agreement, but I, already in a rather spirited frame of mind from my visit to the officers' mess, chipped in and declared: 'Ah, mein Führer, let the poor boys (I might even have used the word 'swine' here) have this pleasure, they don't get any others!' Ignoring my idiotic outburst, Hitler went on to explain how nicotine and alcohol ruined people's health and addled the mind. Now I brought up the big gun and said, referring to photographer Heinrich Hoffmann, 'One cannot really say that, mein Führer. Hoffmann smokes and drinks all day yet is the most agile man in the shop.' At that Hitler clammed up. Without another word he rose quickly and took his leave – 'ice-cold' and with an aggrieved expression, from which I finally saw what I had done. Next afternoon when I inquired of the manservant in what mood the boss found himself today, Hans Junge gave a colleague and myself a long look and said that tea would be taken today without the ladies. Albert Bormann had been told to inform us officially. When I asked him, Bormann admitted in embarrassment that the boss was annoyed with me and would not be requiring the ladies' company at tea. I no longer existed for him. It was to be many months before Hitler forgave my faux pas. 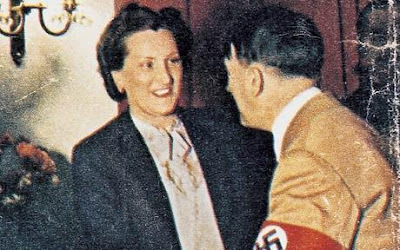 In 1978, Henriette Schirach [the wife of Baldur Benedikt von Schirach, head of the Hitler youth and Reich Governor of Vienna during the Nazi occupation] reminded me of an encounter she had with Hitler on Good Friday, 1943. 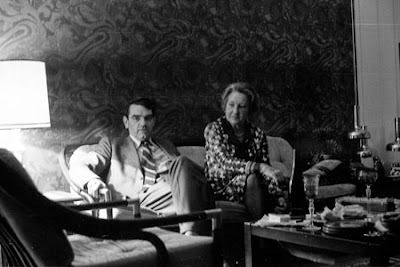 I remember that evening Eva Braun had sat at Hitler's right before she went upstairs, and to the left of Henriette. While the other guests were talking, an argument developed between Henriette and Hitler, the subject of which was an occurrence in Amsterdam a few days previously. She had been awoken at night by an unusually loud disturbance and had watched from a hotel window as some weeping women were ordered forward across a bridge and disappeared into the night. The next day she learned from her friends that this had been a deportation of Jewish women. She promised to bring the matter to the attention of Hitler, which she was now doing. Hitler answered her in a very brusque manner: 'Be silent, Frau von Schirach, you understand nothing about it. You are sentimental. What does it matter to you what happens to female Jews? Every day tens of thousands of my most valuable men fall while the inferior survive. In that way the balance in Europe is being undermined,' and here he moved his cupped hands up and down like a pair of scales.